"Hot Taste Garbage" Bags Lined With Hot Stuff | OhGizmo! You gotta love it when the product page isn’t working. 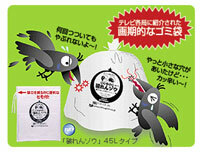 Of course, it’s in Japanse so it wouldn’t make much of a difference for us anyway, but still… Eh, well, it’s ok. Here’s what we think we know about this: they’re garbage bags and they’re possibly called “Hot Taste Garbage”. The funky name comes from the fact that the bags are lined with some hot pepper substance or other, making them particularly distasteful to rodents and other critters that like to pick at your leftover foodstuffs. One nib, and like the packaging suggests, they’ll cry their hearts out in regret. Now, since we can’t access the product page, we’re not sure about price. But we’re seeing $46 being brandied about. If this is true, it better be for 100 bags, because otherwise, you might as well just buy a trashcan. LOL, pretty cool idea. In some parts of South Africa we have problems with baboons riping open out trash (and they know how to open bins) so this would be a great idea here. But I would put the hot stuff on the out side of the bag. I think that the most humourous aspect of this entire thing is that most birds are not sensitive to capsaicin (the active ingredient in chili peppers).